Fact: You don't have to live by the beach to make this work. If coastal design to you is synonymous with anchors, blue and white 'errthang, and seashells upon seashells—we totally get where you're coming from. And you would think, based on the name, that's exactly what it entails, but that's actually more typical of nautical decor. Mind = blown. Coastal is another thing entirely, and while the two have some elements in common, coastal is decidedly less in-your-face and kitschy. So where do you draw the line? Here's exactly what's up. Let's Set The Record Straight—Coastal Is Not The Same Thing As Nautical. Nor is it the same thing as Mediterranean, or tropical. In the simplest definition, coastal is beachy. Through use of natural light, soft tones, and a clean aesthetic, it's meant to evoke the breeziness of the beach. Basically, it feels like summer year-round inside your house. "A coastal space takes its cues from the natural environment for everything from color palette through to materials used," says Will Taylor, author of Dream Decor, and the blogger behind Bright Bazaar. "The core features are usually jute textures, earth tones, layered blues, crisp whites, stripes, and loose linen upholstery." If you have one thing inside a coastal home, it needs to be abundant light. Interiors should never feel dim or cramped, but rather, light, open, and airy. You want to feel as though there's no boundary between indoors and outdoors, so large windows, glass doors, and skylights are key. Window treatments are also minimal (so as not to detract from the natural light, obvs). In order to create a relaxed, easy vibe, coastal design usually incorporates many natural elements. This comes in through the furniture, often made out of wicker, rattan, or light, weathered woods, and fabrics. Rugs are generally straw, seagrass, or jute, and fabrics are simple and devoid of shine. You won't find many metallics or flashy textures, but rather, natural materials or light, billowy fabrics, like sheer curtain panels. Though wood is common, it will usually be white-washed, or a blond maple or ash. 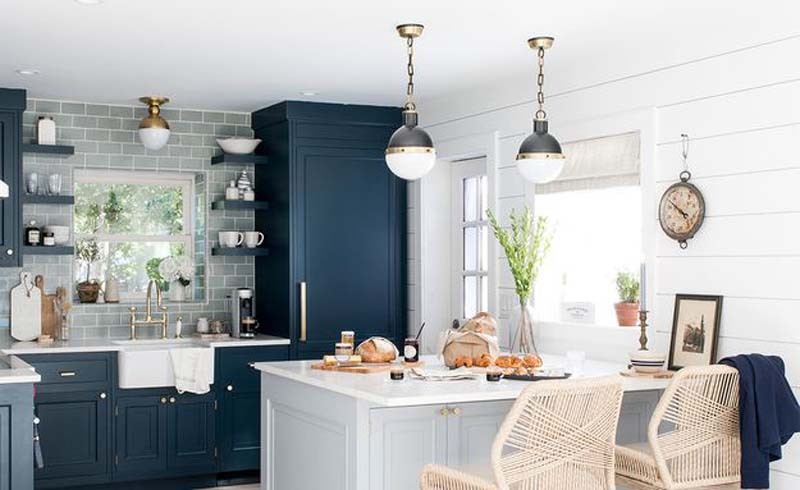 While you might be inclined to picture a bold blue and white palette when you think of coastal, a crisp, white interior is actually more accurate. It's almost like minimalist design in the sense that less is more, and it favors neutral. Again, it's all about natural light, so a white room is going to make the space feel even airier. But that doesn't mean you can't accent with color. Though you'll still want to keep it soft (remember, there is nothing bold about this design), accent colors typically include neutrals, such as a warmer beige or khaki, light blues, greys, and greens. The palette "can be adjusted according to taste: true blues and crisp whites for a Med-like vibe; warm whites and pale blue-green shades for a country coastal mix; bright coral paired with sky blue for an exotic coastal style," Taylor says. It's no surprise that a design aesthetic that prioritizes light would favor an open floor plan. You don't want to clutter anything with furniture or decor, but rather, create the feeling that everything just flows. 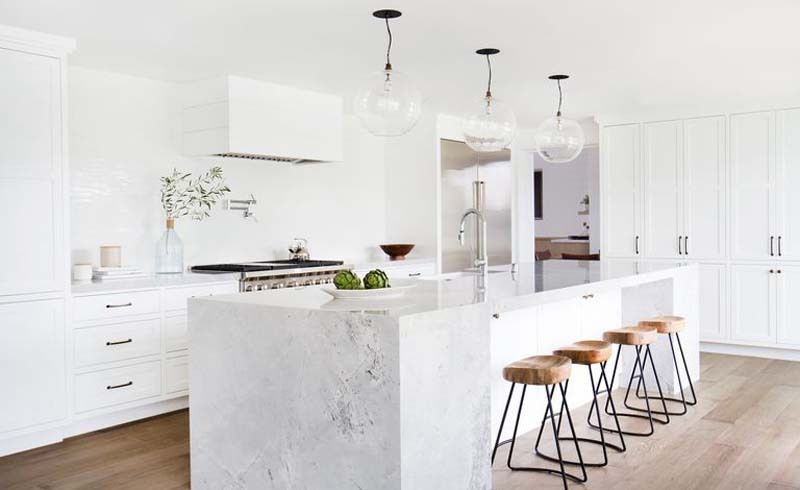 If you aren't able to open up your floor plan, you can still create as much open space as possible by paring down and opting for a more minimalist vibe. If you're decorating for the coast, it's not like you're about to decorate with antlers or modern, geometric accents, so it's totally OK to add in a few seaside touches, like shells, glass bottles, or woven baskets, but the key is not to go overboard. You want it to feel easy and natural, not kitschy and overdone, and clutter is a serious no-no. Keep it simple and you can't go wrong. "The key is to stay away from anything too cliched," Taylor says. "Avoid anchor prints, “beach this way” signs, etc. Instead, take your lead from the elements of the coast: a collection of blue glass vases and bottles upon a fireplace hearth, or a classic blue and white stripe wallpaper to add striking visual interest to a stairway or hallway." U.S. Daily News: What Is Coastal Design?